N51and N44 in Dorado: a massive complex that also includes NGC 1955, NGC 1968. These are the huge superbubbles N51D and N44, which contains the first ever extragalactic Herbig Haro object to have been discovered in 2005. 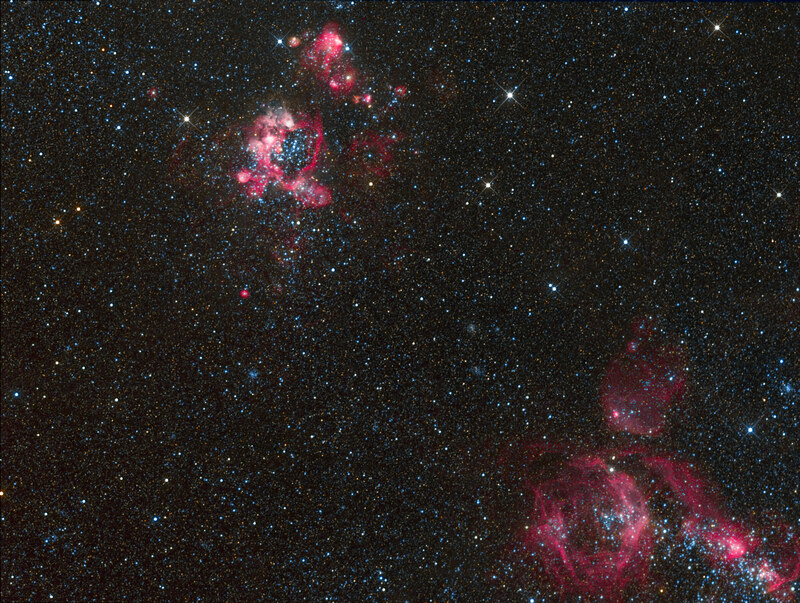 N44 (right-down) is a large HII region in the LMC with the size of the "hole" about 250 light years across. 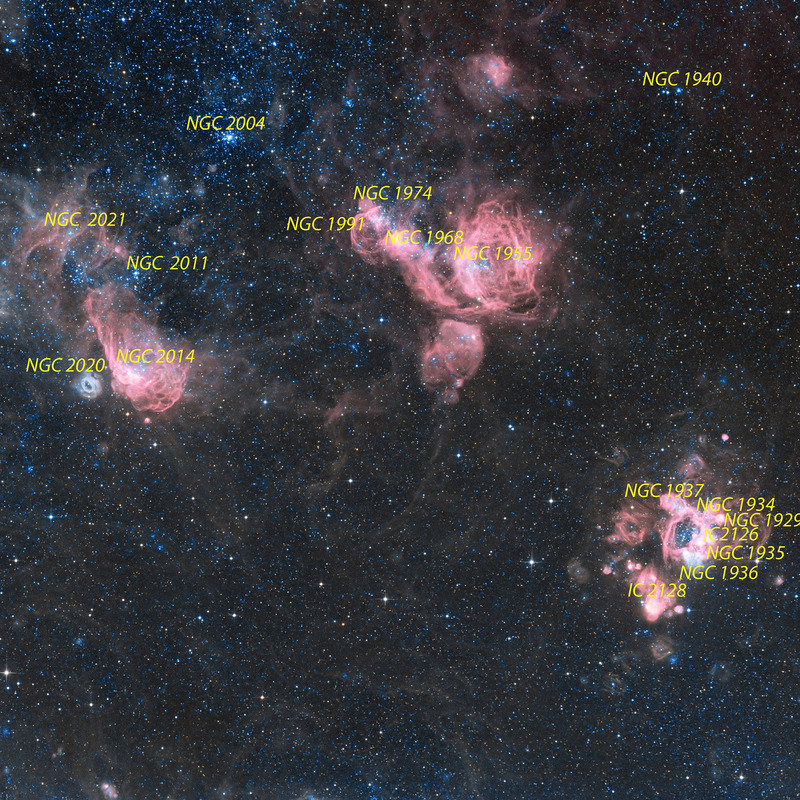 The Large Magellanic Cloud (LMC) is actively producing new stars. Some of its star-forming regions can even be seen with the naked eye, for example, the famous Tarantula Nebula. However, there are other smaller - but no less intriguing - regions that telescopes can reveal in intricate detail. The pink-tinged cloud on the right, NGC 2014, is a glowing cloud of mostly hydrogen gas. It contains a cluster of hot young stars. The energetic radiation from these new stars strips electrons from the atoms within the surrounding hydrogen gas, ionising it and producing a characteristic red glow. In addition to this strong radiation, massive young stars also produce powerful stellar winds that eventually cause the gas around them to disperse and stream away. To the left of the main cluster, a single brilliant and very hot star seems to have started this process, creating a cavity that appears encircled by a bubble-like structure called NGC 2020. The distinctive blueish colour of this rather mysterious object is again created by radiation from the hot star - this time by ionising oxygen instead of hydrogen. The strikingly different colours of NGC 2014 and NGC 2020 are the result of both the different chemical makeup of the surrounding gas and the temperatures of the stars that are causing the clouds to glow. The distances between the stars and the respective gas clouds also play a role.